I picked up Kiera Cass's The Siren to get a head-start on my mermaid novel "market research" project. Despite certain aspects I wasn't crazy about, this was a fairly decent read. Kahlen is one of the Sirens, a group of teenage girls who nearly drowned and now serve the Ocean by singing humans to their deaths. Kahlen's 100-year sentence will end in 20 years; and until then, she's not allowed to speak to humans (or else her voice will poison them) or engage in relationships with them (either romantic, familial, or platonic). She's determined to finish her sentence in obedience - until she meets Akinli. Their short time together reminds Kahlen of the freedoms she misses and the one thing she's always wanted: true love. How can she find a way to follow her heart without breaking the Ocean's rules - and be forced to leave Akinli forever? The Siren is primarily a love story, and that part sadly fell flat for me. It's pretty much "insta-love"; it only takes Kahlen two conversations, several text messages, and one date before she confesses to being in love with Akinli. (Though they had a cake-baking date - and now I want one, too!) I was also annoyed that Akinli was portrayed as the "perfect guy." There's nothing wrong with a young male character who's sweet, kind, and goofy, but he's not believable if he lacks flaws. So, anything that pertained to the The Siren's romance, especially Kahlen's depression when she and Akinli were separated for a while, got little more than a shrug from me. BUT. There's more to The Siren than romance. 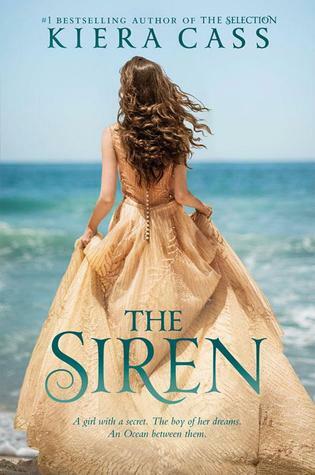 The siren mythology that Kiera Cass created - how the girls become sirens, the rules they follow, what happens when their sentences end - was enchanting. This led to the Ocean being a character, an entity who's fearsome yet fiercely loving, selfish yet tender. My favorite relationships, though, were those between Kahlen and her siren sisters. Each girl has a distinct personality and ethnic background; and despite their differences (especially in how they cope with their siren rules and semi-immortality), the girls remain loyal to one another. In fact, The Siren serves more strongly as a tale of friendship and adopted family than a love story. That, along with the fantasy elements, made the book worthwhile in the end. Sign into Goodreads to see if any of your friends have read The Siren. 35.47% "Not bad so far. The siren mythology that Kiera Cass created here is interesting, and I definitely understand why Kahlan would be so haunted by the task she must carry out. But... she already loves Akinli after seeing him only three times? I'm sorry, but I never buy insta-love. Insta-like, yes. But she already says she loves him? (*shakes her head*)"
43.43% "I just realized that this month is February, and all the books I've read this month are love stories. *blinks*"
43.43% "I just realized that this month is February, and all the books I've read so far this month are love stories. *blinks*"
61.77% "I want to like Akinli... but... I don't know, he seems too perfect, almost too likable. Still, this is a decent story so far." 73.39% "Still not impressed with the love story. But I like the relationships between Kahlen and her siren "sisters." In some ways, this book is just as much about the strength and support of friendship as it is about first love." 87.77% "Should be able to finish this tonight. I've had to read in short spurts only because I've been too tired to read as much as I usually do. :/"
Jeneca wrote: "Ooh I didn't know you have mermaid project! How is it coming? I'm having trouble finding good mermaid books :P"